Editor’s Note: This commentary and photo were contributed by Suzanne Bellamy who exhibited her painting, “Woolf and the Chaucer Horse,” at the 21st Annual International Conference on Virginia Woolf. Researching illuminated manuscripts and Psalters opened the vision of the written page to the visual world that has always been there for me in Woolf as a reader. The page drips with image and interaction with other form, and as a writer of that tradition she embodies that now invisible world. Woolf says in ANON that the printing press ultimately took that rich layered other dimension away, but she is still soaked in it in her visual invocations, in her synaesthesic imagination. I started working on the painting as I was reading the scholarship around Between The Acts, the late 1930s and Woolf’s last writings. Seeing her riding on Chaucer’s horse, as the Chaucer of her times, came visually first, then all else flowed from that. The Chaucerian trope of the stories wrapped within the journey infuses all Woolf’s work, as also in the essayistic form itself, street haunting being an expression of the pilgrim’s way. The painting is as much an illuminated manuscript as a map… as a collage of layered memory, where everything happens and all at the same time, as in the novel. In harmony with the 1930s’ rural revivalism and sensitivity to possible loss of cultural heritage, the spirit of continuity is challenged by the threat from the planes and the coming war. But the land itself holds the dream of a common culture which is soaked in Nature and wild forms, animals birds, structures and sounds. Some images swirled around in my head for weeks but never made it onto the canvas much as I tried to force the issue. 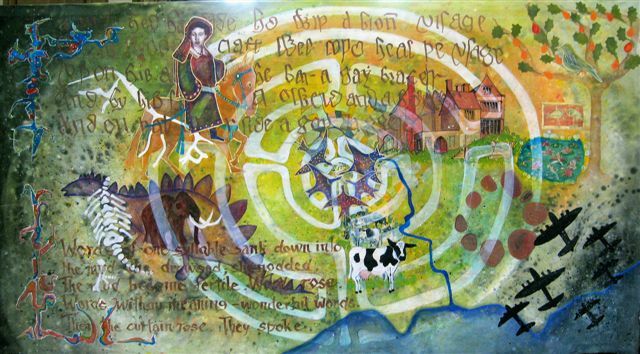 The old wall and the ladder, the horse with the green tail, Sohrab the dog, the greenhouse, Mrs. Swithin’s hammer, and also Mrs. Swithin’s criss-cross letter (a term from ancient manuscripts), imps, elves, demons and mirrors, all the flowers, cars, the barn, the pub, the megaphone, Giles feeling chained to a rock, the white lady — those never made it but are in there somehow. But the stegasaurus and the mammoth made it, and the fossils, the Roman roads, the planes, the pond, the house (taken from Vita Sackville-West’s book on English Country Houses), the cows, the Ouse and the map of the Sussex coast, and then the Celtic maze which held it all together. The maze, the Chaucerian horse, and the lines of the Prologue were the moments that gave it all a structure. The idea that words came from hearing birdsong drawn from the core of the maze holds the centre. There are several examples of doubling and tripling images, as for example with the Uffington White Horse, the Guernica Horse and the Chaucer Horse. Also with the Circle of Birds and the formation of Lancaster Bombers over the English Channel, as contrary formations. The South Downs, the coastline, the map of Sussex, Lewes and Rodmell, the River Ouse and tributaries, prehistory, mastodons, cars and Roman roads, images improvised from medieval illuminated manuscripts. I used the Oxford Ellesmere text for the five lines of the Prologue to the Canterbury Tales. Copying those five lines straight onto the canvas from the Prologue to the Canterbury Tales, from the online Oxford site of the Ellesmere text, was a deep thrill. The painting, which measures two by four metres, was planned to act as a set canvas behind the pageant performance, but that proved to be technically impossible. In the end it hung in the Bute Hall below the stained glass windows, close to the window of Chaucer. 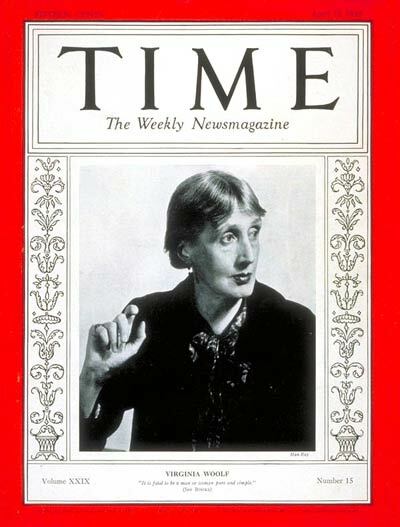 The light streamed through the image of Woolf on her horse, the Chaucer of her times, and all was well.